Before the outbreak of the first World War, Vaughan Williams composed a number of incidental musics on often quite varied subjects, the most substantial of all being The Wasps (Hallé CD HLD 7510 reviewed here) but also for two plays by the Belgian playwright and author Maurice Maeterlinck whose own Pelléas et Mélisande was a mine for numerous musical settings by Debussy of course but also by Sibelius (incidental music Op.46 – 1905), Fauré (incidental music Op.80 – 1898) and Schoenberg (symphonic poem Op.5 – 1902/3) to name but a few that come to mind. Vaughan Williams composed some incidental music for an apparently isolated staging of The Death of Tintagiles recorded by the late Richard Hickox (Chandos CHAN 9646) whereas the music for The Blue Bird does not seem to have been performed ever since the score in the Vaughan Williams collection housed at the British Museum is “in cued piano and short score, and in the composer's handwriting” (Martin Yates). The music for The Blue Bird is apparently intended to be used towards the end of Act 1 and consists in a suite of dances displaying many characteristic finger-prints to be found in much of Vaughan Williams's later output, especially some folk-inflected tunes. The introduction to the first dance also somewhat hints at some forthcoming 'grand tunes' as heard in some of Vaughan Williams's film scores. There is much fine thematic material throughout this short suite and it must be said that Martin Yates's orchestration is quite idiomatic. In the early years of the 20th century Vaughan Williams made one of his folksong-collecting trips to Norfolk during which he noted down of number of songs. In the wake of this trip to Norfolk Vaughan Williams quickly started composing three rhapsodies on folk material thus gathered. The Norfolk Rhapsody No.1 in E minor, written in 1906 and revised in 1914, is the best known of the three for the very simple reason that it is the only one to have ever entered the repertoire and to have been repeatedly recorded. I had not heard it for quite a long time and, while hearing it again, I was again quite impressed by the way it is constructed and by the pregnant atmosphere distilled in the orchestral writing. The Norfolk Rhapsody No.2 in D minor composed in 1906 was heard at the Cardiff Festival in 1907 as was the Norfolk Rhapsody No.3. Withdrawn by the composer, the Second Rhapsody was long thought unplayable (two pages had gone missing) until Stephen Hogger completed it with reference to the detailed programme notes of the early performances (more about this later in this review). Vaughan Williams remained quite prolific to the end of his life and in 1957 he completed his Variations for Brass Band first performed as the test piece at the National Brass Band Championship at the Royal Albert Hall in 1957. This late work displays a remarkable wealth of invention and imagination. Such was its appeal that Gordon Jacob orchestrated the piece and the orchestral version was first performed in Birmingham. It may also be of some interest to know that Donald Hunsberger made an arrangement for wind band available on Sony CBS MK 44916. 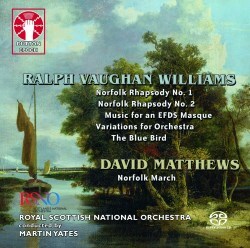 Given his own ties and involvement with the EFDS, Vaughan Williams composed some works for annual masques held at the Royal Albert Hall, some of these occasional works seem to have disappeared until now and what remains is a short, lovely A Folk Dance Medley which was orchestrated by Vaughan Williams and of which orchestral parts existed. As suggested by the title this short work is based on a number of folk songs that many will probably spot more readily than I although I did spot some. Martin Yates also orchestrated another short piece – probably composed for yet another EFDS masque – recorded here too - the Little March Suite, actually a near cousin of the somewhat better-known Sea Songs of 1923. Now, back to the Norfolk Rhapsodies. Although the existence of the Norfolk Rhapsody No.3 is not to be denied, the score and parts seem to have disappeared for whatever reason and have still to resurface, but at the time of the first performance at the Cardiff Festival detailed programme notes quoting the folk tunes used by the composer and and how they fitted in the piece were written by W.A. Morgan. These programme notes are what served as basic material of David Matthews's Norfolk March which follows the template described by Morgan. So, the piece unfolds according to Morgan's descriptions until about mid-way through the piece when the mood of the music dramatically changes (the work was completed in 2016 the centenary of the Battle of the Somme) and becomes more stringent and warlike before it unfolds back to some calmer, though still uneasy mood and it ends with “a kind of Last Post on trumpets, deliberately recalling Vaughan Williams's trumpet solo in his Pastoral Symphony” (David Matthews). Martin Yates's credits as outstanding interpreter of Vaughan Williams's music are quite well-known and his commitment is fully shared by the Royal Scottish National Orchestra in top form. Lewis Foreman's notes, as informative as ever, are a real asset to this outstanding release which will be a must-have for all RVW completists.